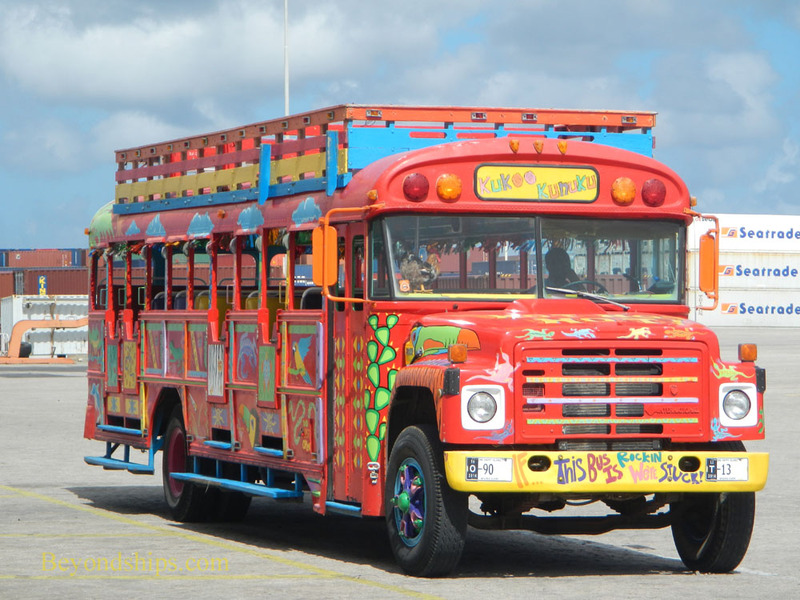 The Kukoo Kunuku buses are famous in Aruba. Indeed, with music blaring from these brightly painted vehicles full of carefree partiers, it would be difficult not to notice them. Thus, when our ship offered a shore excursion in which the Kuku Kunuku bus would be going to Aruba's renown Palm Beach, we had to give it a try. The inspiration for Kukoo Kunuku comes from the chiva buses that would go around to the rural villages in Columbia and Panama collecting farmers and craftsmen and taking them to market. The people would sell their goods at the market and so on the return trip, they were in a mood to party and would do so on the buses. In 1997, Marcus Wiggins and Cindy Cynowa brought the party bus concept to Aruba. 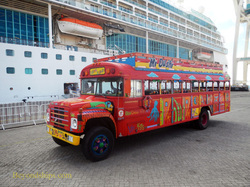 However, rather than transport local artists and farmers to market, the bus would transport tourists around the island. They started with one bus and now have several. The Kukoo Kunuku buses do pub crawl and nightlife tours in the evenings. During the day, they take tourists to the beaches and various points of interest. The Kukoo Kunuku buses are not luxury coaches. Rather, they are essentially converted school buses. Painted in festive colors and with various slogans scribbled on the sides, it is clear at a glance that what the Kukoo Kunuku buses are all about is lighthearted fun. Our Kukoo Kunuku tour began in the morning. The passengers were a mix of ages ranging from families with children to seniors. How much of a party mood would these people be in at this early hour? The answer became clear as soon as the passengers had boarded the bus. 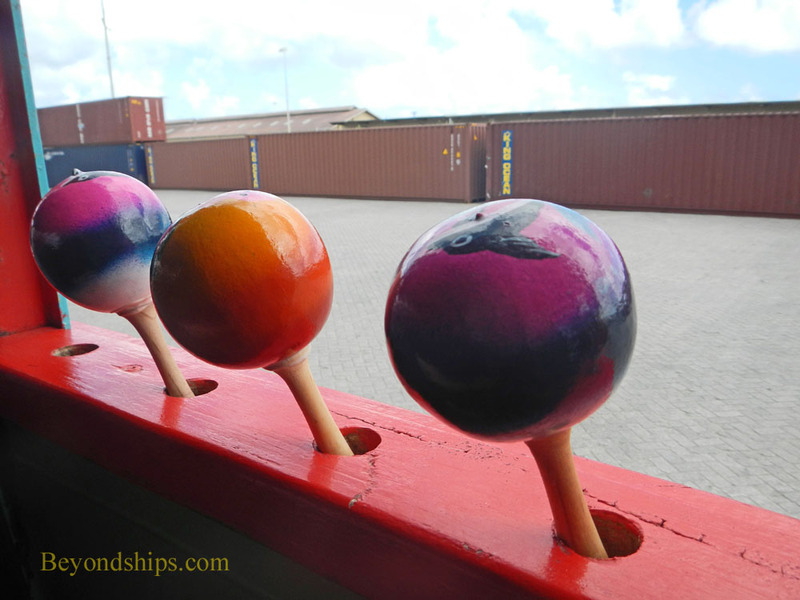 They immediately grabbed the colorful maracas that are kept in racks by each window. When the driver began to rev up the crowd over the intercom, they replied with shouts and laughter. We set off, music playing over the intercom. Most of it was from the 1950s and 1960s. All of it had a strong beat. It was good times music and the passengers responded by singing along or playing their maracas. When we reached a roundabout, the driver spun us around its center island several times to the delight of the passengers. From time-to-time, the bus would slow down and the driver would encourage everyone to shout out to someone walking along the road. Some of these pedestrians were apparently friends of the driver, others were strangers who appeared somewhat puzzled at being haled by a bus load of party-makers well before noon. Still, all seemed to fall in with the spirit of the moment and smiled. ﻿The tour continues with the landmarks the bus visited﻿.